Borophene—two-dimensional (2-D) atom-thin-sheets of boron, a chemical element traditionally found in fiberglass insulation—is anything but boring. Though boron is a nonmetallic semiconductor in its bulk (3-D) form, it becomes a metallic conductor in 2-D. Borophene is extremely flexible, strong, and lightweight—even more so than its carbon-based analogue, graphene. These unique electronic and mechanical properties make borophene a promising material platform for next-generation electronic devices such as wearables, biomolecule sensors, light detectors, and quantum computers. Now, physicists from the U.S. Department of Energy's (DOE) Brookhaven National Laboratory and Yale University have synthesized borophene on copper substrates with large-area (ranging in size from 10 to 100 micrometers) single-crystal domains (for reference, a strand of human hair is about 100 micrometers wide). 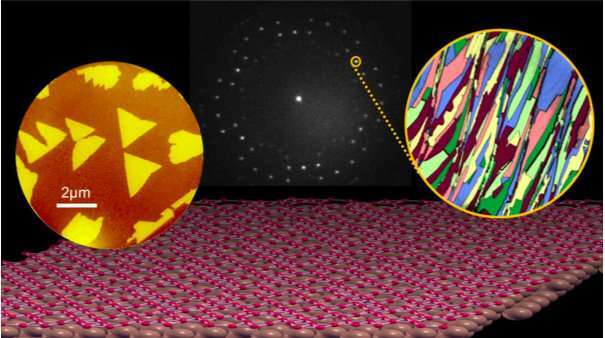 Previously, only nanometer-size single-crystal flakes of borophene had been produced. The advance, reported on Dec. 3 in Nature Nanotechnology, represents an important step in making practical borophene-based devices possible. For electronic applications, high-quality single crystals—periodic arrangements of atoms that continue throughout the entire crystal lattice without boundaries or defects—must be distributed over large areas of the surface material (substrate) on which they are grown. For example, today's microchips use single crystals of silicon and other semiconductors. Device fabrication also requires an understanding of how different substrates and growth conditions impact a material's crystal structure, which determines its properties. 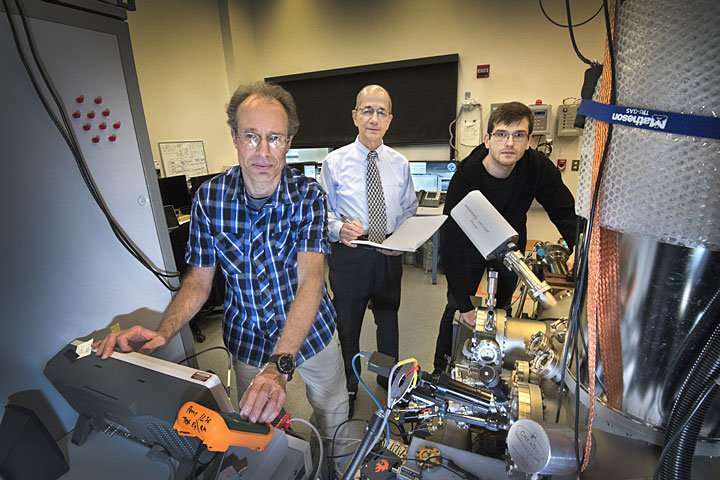 "We increased the size of the single-crystal domains by a factor of a million," said co-author and project lead Ivan Bozovic, senior scientist and Molecular Beam Epitaxy Group Leader in Brookhaven Lab's Condensed Matter Physics and Materials Science (CMPMS) Department and adjunct professor of applied physics at Yale University. "Large domains are required to fabricate next-generation electronic devices with high electron mobility. Electrons that can easily and quickly move through a crystal structure are key to improving device performance." Since the 2004 discovery of graphene—a single sheet of carbon atoms, which can be peeled from graphite, the core component of pencils, with Scotch tape—scientists have been on the hunt for other 2-D materials with remarkable properties. The chemical bonds between carbon atoms that impart graphene with its strength make manipulating its structure difficult. In this case, the patterns revealed that the single-crystal borophene domains were only tens of nanometers in size—too small for fabricating devices and studying fundamental physical properties—for all growth conditions. They also resolved the controversy about borophene's structure: both structures exist, but they form at different temperatures. The scientists confirmed their LEEM and LEED results through atomic force microscopy (AFM). In AFM, a sharp tip is scanned over a surface, and the measured force between the tip and atoms on the surface is used to map the atomic arrangement. To promote the formation of larger crystals, the scientists then switched the substrate from silver to copper, applying the same LEEM, LEED, and AFM techniques. Brookhaven scientists Percy Zahl and Ilya Drozdov also imaged the surface structure at high resolution using a custom-built scanning tunneling microscope (STM) with a carbon monoxide probe tip at Brookhaven's Center for Functional Nanomaterials (CFN)—a U.S. Department of Energy (DOE) Office of Science User Facility. Yale theorists Stephen Eltinge and Sohrab Ismail-Beigi performed calculations to determine the stability of the experimentally obtained structures. After identifying which structures were most stable, they simulated the electron diffraction spectra and STM images and compared them to the experimental data. This iterative process continued until theory and experiment were in agreement.